Someday very soon the above picture will be reality. God’s word says so. 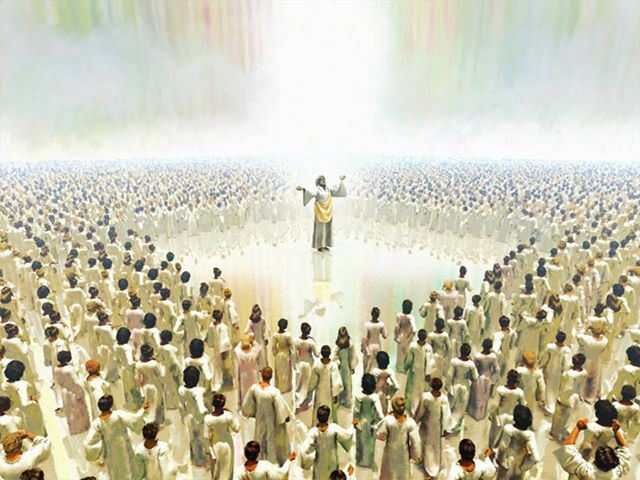 Yet we as Elijah messengers often think to ourselves that because it seems that so few are interested in the Lord’s final sealing message,there just cannot be found 144,000 among us SDA until a long long time from now. The Jewish church, the church into which and by which Jesus was born, Inspiration declares, neither travailed nor had pain; that is, she felt neither need of nor burden for a Saviour, and yet in spite of it, He was born. Although the Jewish church in Jesus’ day travailed not, yet she brought forth the Son of God! But when Zion travaileth she brings forth all her children at once, a whole nation! A miracle in each instance. How may Zion travail? — Let us turn to the natural realm: In nature, the mother carries a child, then travails and gives birth to it. How else, then, in the spiritual realm can Zion travail without first carrying her children before they are born? To be specific, when one joins the church, she is pregnant with him so to speak. When she is thus carrying her children, then they shall all be born at once, — they shall all at once receive their second birth, the birth here mentioned. And as Inspiration makes it clear that they must be born again, they all at the outset must be in the same state of mind as was Nicodemus — ashamed to be seen in the company of present Truth believers, ashamed to be associated with believers of unpopular Truth. Plainly, then, our efforts to reach the people with the message of a “second birth” shall not be in vain: Zion shall bring forth all her children, as it were, in one day. And that is why we cannot be driven to despair or to discouragement. We are assured that “revival and reformation” will take place among all God’s people, that His word will not return unto Him void. Now, who could the children be? — To be children of Zion, they must some day stand on Zion. They are therefore none other than the “firstfruits” of whom the Revelator says: “And I looked, and, lo, a Lamb stood on the Mount Sion, and with Him an hundred forty and four thousand, having His Father’s name written in their foreheads.” Rev. 14:1. “nation”, the 144,000, shall come forth in “one day”. We also seem to say to ourselves and sometimes to others that few are following His final message yet as we see there is “7000”, which is a complete number of thousands (7) of which the Lord knows and we don’t. In other words, the Davidian Seventh-day Adventists organizations, although not nearly consisting of the 144,000 now, will be joined by the unknowns, most likely in our SDA churches. Soon the faithful walking in all the light they know, dress reform, diet reform, worship reform, etc. and having no guile in their mouth will have to come up to speed on the Elijah message in a very short period of time. “They follow the Lamb wherever He goes.”? Yes the Truth that springs from our King, strange , difficult and most unpopular is the 144,000’s path, their passion their hope. Yet it leads them often to be dis-fellowshipped, murmured against, unpopular, seen as strange or overzealous, fanatical and God knows what else. But they continue to follow the Lamb! Apostle Paul knew all too well that the faithful followers would have to bear the burden of unpopularity. The Truth in both cases took the followers down a path that was unpopular. So today those who are stepping forward with the Lord’s final message of Elijah must lean on the Lord heavily because they will see and feel the rejection that has always accompanied the true believers. Um, “outcast”? From what? You got it the very churches that proclaim to be God’s house! The Jews praised the Lord upon removing the offshoots (Christians) from their midst and now today the same blinded leaders think they are doing a good service in dis-fellowshipping and ignoring those who proclaim the Lord’s Rod message (Micah 6:9). Hang tight all you who are enduring the rejection and ignorance because you proclaim an unpopular Truth, the tide is going to turn shortly. This entry was posted on November 5, 2016 at 2:49 am and is filed under Courage, Present Truth. You can follow any responses to this entry through the RSS 2.0 feed. You can leave a response, or trackback from your own site.